I just finished my first ever pair of socks!!!!! I am so pleased with these and the fact that the stripes match - even though they are not quite identical in the heel area - but unless I wear them with clogs, no one will ever see that bit so ssshhhhh! I'm trusting you with my secret. 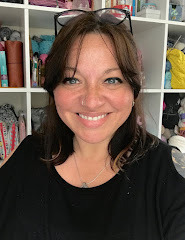 The lovely Tickety-boo (aka Gilly) - now my sock guru - was kind enough to get me started by recommending the book above as well as sending me this heel-turning tutorial which prepared me for what I expected to be the hardest bit. 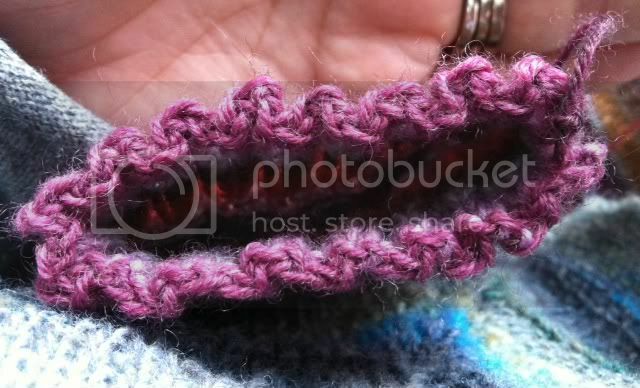 Once I had the pattern it all made complete sense and was much much easier than I expected. Sure, this is a simple pattern, but now I feel confident to make more intricate patterns and to try a different heel type - which is good as there is now a knitting request queue forming in my house. 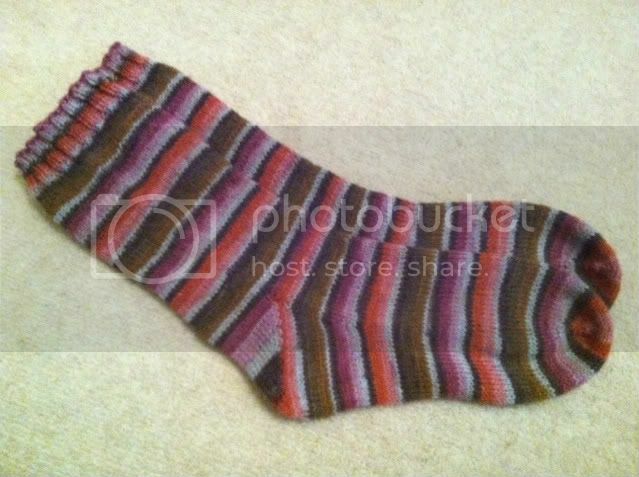 For anyone thinking of trying to make socks, I would definitely encourage you to give it a go - this really was very simple, great TV knitting, small and portable, and a relatively quick knit - no wonder they are addictive! If you're not convinced, have a look at the post over at Misadventures in Craft yesterday which says it all. Hope you have a great weekend and get time to check out the other FOs at Tami's. Sqqqqqqqqqquuuuuuuuuuueeeeeeeeeeeeeeeeeeeeeeeee!!!!!!!!!!!!!!!!!! Well done Sarah they are so fabulous. Thank you for the mention, I am glad I was of help but I am sure you would have made a beautiful job of them anyway. Now you too can be addicted. Congrats on your first pair!!!! Here's to many, many more. They are faaaaabulous. I think I just bought my sister this very same yarn as part of her birthday present. If hers look as good as yours she'll be thrilled. Great job on your first pair of socks! 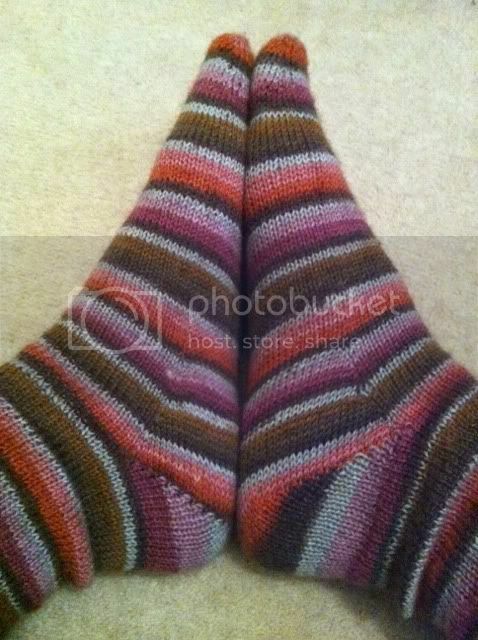 There is just something about sock knitting that is so satisfying, don't you think? 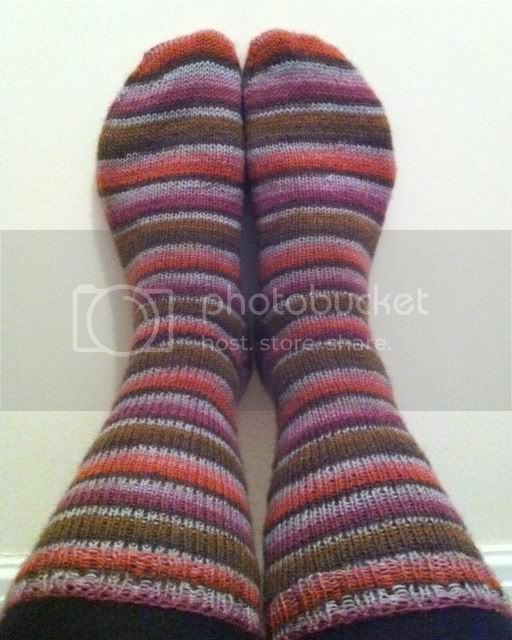 I think it has to do turning the heel and creating a hand knit that actually is so form fitting. The color you chose is lovely too. Gorgeous! Well done, I can't wait to try some socks of my own. fantastic! they are just gorgeous, well done! yay! It's a slippery slope now ... once you've got the sock bug there's no going back! They are a sickeningly good first pair of socks! But I couldn't expect anything less from a like minded perfectionist! I'm also hoping to do my first pair this year. ps DId you check out my giveaway yet? 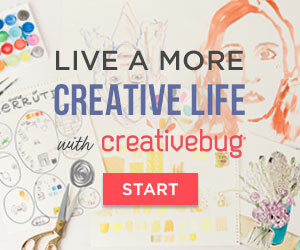 :) www.acreativebeing.com! They look awesome, and at the moment my feet are cold. Might be because I've been sitting here too long, lol. One day I shall make socks...one day. Fantastic first socks, they look great. I love the colors of those socks! I bet they're super comfy!